The Original Bootlegs are a set of 6 different live shows recorded in England and America during the Original Sinsuality and Summer of Sin tours supporting the release of The Beekeeper in 2005. A website, toribootlegs.com was launched at the end of the summer and allowed fans to pre-order the albums, then sold them two by two until the sale of a 12-CD boxset featuring the six shows on December 6, 2005. Each album includes 2 CD in a minimalist carton-sleeve with a different “animal totem”: snake, bee, lizard, eagle, humming-bird... People who bought all six bootlegs before November 22 received their albums in a special case and six exclusive hexagon-shaped stickers. Tori decided to call this series of live albums Original Bootlegs because she felt sorry that fans often had to pay for poor-quality audience recordings. Each album features around 18 tracks of Tori playing solo on her Böse and Hammond B3 organ. A special thing on these recordings are the covers she performed live during the “Piano Bar” section in the middle of each show: fans suggested her songs from other artists through her website and she performed two of them each night. On the Original Bootlegs, you’ll then find stunning performances of “Like a Prayer” (Madonna) or “Don’t Look Back in Anger” (Oasis) and most of the songs from The Beekeeper have a different arrangement than on the album, testifying of Tori’s constant reinvention. For people who maybe didn’t like the treatments of some of the songs on the record, it can be the occasion to re-discover them —for my part, I fell in love with “Jamaica Inn” after hearing the live performance of the Los Angeles album. 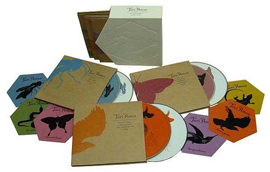 The boxset sold out very quickly and used or collectible copies can now be found on eBay or other sites for 200 euros. Epic/Sony BMG later re-released the albums individually with a white carton-sleeve instead of the original brown carton-sleeve and new copies of this edition can still be bought on Amazon for about 15 euros each.